The effect of dietary substitution of Undaria pinnatifida with carrot leaf by-product (CLB) on the growth performance and soft body composition of juvenile abalone (Haliotis discus) was determined. A total of 1080 juvenile abalone were randomly distributed into 18 cages (60 per cage). Five formulated diets and dry U. pinnatifida were prepared in triplicate. The 20% U. pinnatifida was included in the control (CLB0) diet. The 25, 50, 75, and 100% of U. pinnatifida were substituted with an equal amount of CLB, referred to as the CLB25, CLB50, CLB75, and CLB100 diets, respectively. Finally, dry U. pinnatifida was prepared to compare the effect of formulated diets on growth performance of abalone. Abalone were fed with one of the experimental diets once a day at a satiation level with a little leftover for 16 weeks. Water stability of dry matter content in all formulated diets was changed over all the observation periods, and their significant interaction was also observed. 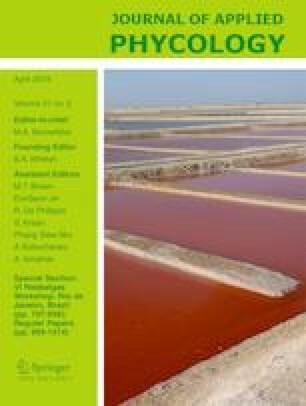 The retention of dry matter content in all formulated diets was significantly (P < 0.05) higher than that in the dry U. pinnatifida at all periods of observation after seawater immersion. Survival, weight gain, and specific growth rate (SGR) of abalone fed all formulated diets were greater than those of abalone fed the dry U. pinnatifida. However, weight gain and SGR of abalone fed the CLB25, CLB50, CLB75, and CLB100 diets were not significantly (P > 0.05) different from those of abalone fed the CLB0 diet. Shell height, width, and length of abalone fed all formulated diets were significantly (P < 0.05) higher, wider, and longer than those of abalone fed the dry U. pinnatifida. Proximates of the soft body of abalone were not affected by the experimental diets. In conclusion, U. pinnatifida could be completely (100%) substituted with CLB in formulated abalone feed without retardation in the growth performance of abalone. This research was supported by Basic Science Research Program through the National Research Foundation of Korea (NRF) funded by the Ministry of Science, ICT & Future Planning (2017R1A2B4009773). This work was also supported by a grant from the National Institute of Fisheries Science, Republic of Korea (R2019010).